The Gideons International has been working on a unique mission of distributing Bibles and New Testaments around the world. 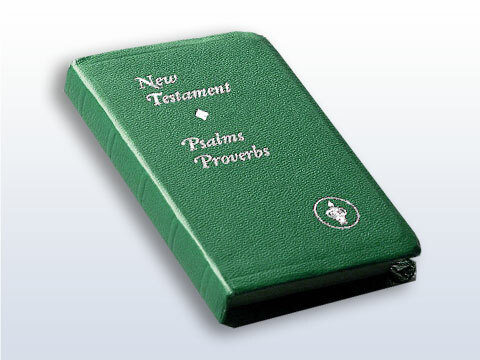 Gideons have given, placed and distributed more than 1.9 billion Bibles in 190 countries across the globe. A small Gideons pocket Bible. Gideons or their partners are in almost every city or country. Their primary mission is reaching students in 5th grade and above, prisoners, policemen, doctors, nurses, military, fire and life critical services. They also place bibles in hospitals, hotels, convalescent homes, shelters for poor and afflicted, motels, prisons. 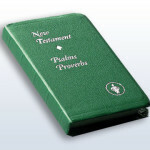 Gideons have so far printed Bibles in more tha 90 languages. If you are a new born Christian or would like to know about Christ and in need of a Bible but cannot afford one or find one near you, you can directly write to them using this link. If you would like to become a sponser or an active member of Gideons, you can donate through this link or become a member here. You can also grab a copy of a Bible from a nearby Book store if you can afford one. You can also invite Gideons to distribute Bibles at your hospital or at your school and be a part of a fruitful Christian in spreading the word of God to the millions. Next story What does the Bible say about Divorce? I would like to know how I can purchase 100 of the bibles to give to our wedding guest?